Last week a friend and I were chatting about the importance of experimenting with our art and technique. 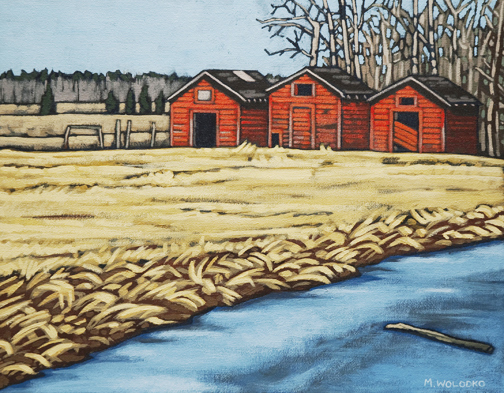 Of course it’s much easier to keep painting things that have worked in the past – which is what I tend do do. So I decided that maybe it was time to leave my comfort zone. There are a lot of things I don’t know how to paint but I usually just dive in, with varying results. 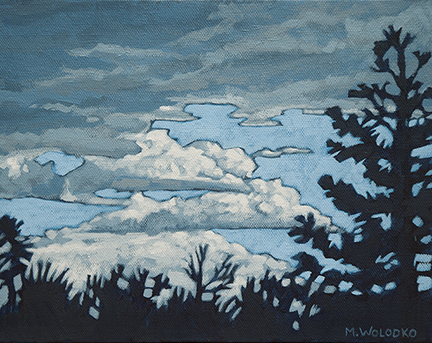 But I am intimidated by painting skies. I avoid them whenever possible. They make me freeze up and I don’t know how to do them. So this is the first of a couple of sky paintings. I hope I learn something. 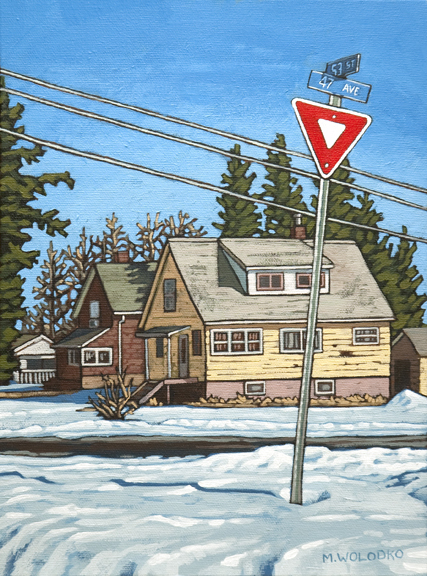 This is the first of two paintings I’m working on that prominently feature a yield sign. As I’ve worked on these I have been thinking and wondering – what is it about the yield signs? Why do I feel compelled to paint them?? I love the splash of red, but it’s more than that. I am not drawn to stop signs in quite the same way. I do, however, have the same attraction to power lines and light poles – they make a painting more interesting somehow. Yield sign #2 should be completed next week. 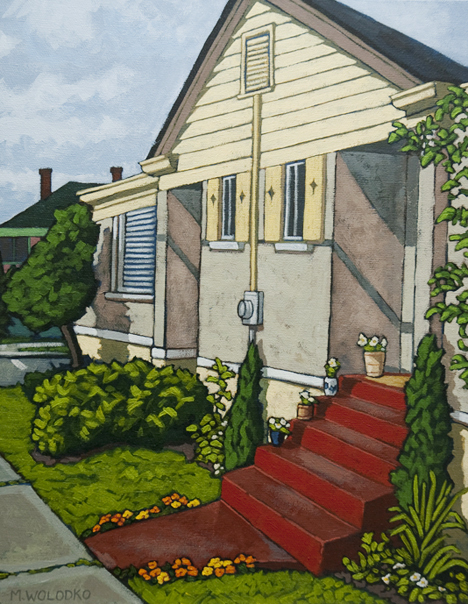 The Red Steps - 14" x 11"
My children and I walked by this house many times in the summer, on the way to a near-by playground. Actually, it is part of a row of townhouses. I imagine it must be fairly old, but I always admire how well-kept it is. The shutters, the siding, the flower pots, the garden and, of course, the red steps all looking their best in the hot afternoon sun. Too often I see character houses such as these with development signs out front, soon to be demolished. If you see a strange woman rushing around the neighbourhood taking photos of old houses, it’s probably just me. 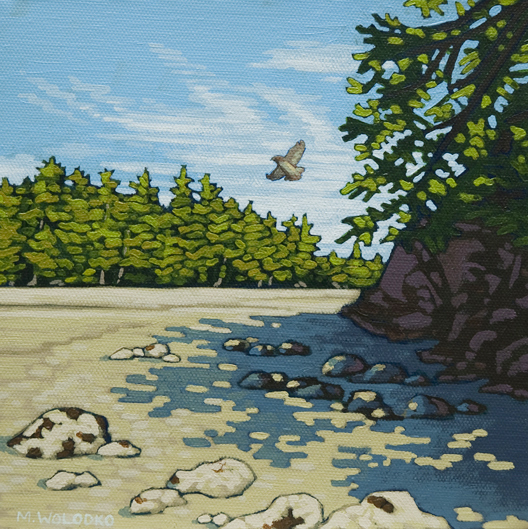 Low Tide 8" x 8"
I recently did a painting similar to this one at a smaller size (see it here). That painting was posted on Etsy, which gave rise to a message from a new client with a request to do a customized painting, as a gift for her mother. my grandma died when my mom was 5 or so. Whenever she sees a hawk, she feels like it is her mom keeping an eye on her and letting her know everything is o.k. Consequently, I now think of my mom when I see a hawk. Knowing that this painting had a personal meaning to someone else made it extra special to work on. I hope Carrie and her mom enjoy this painting as much I enjoyed working on it. 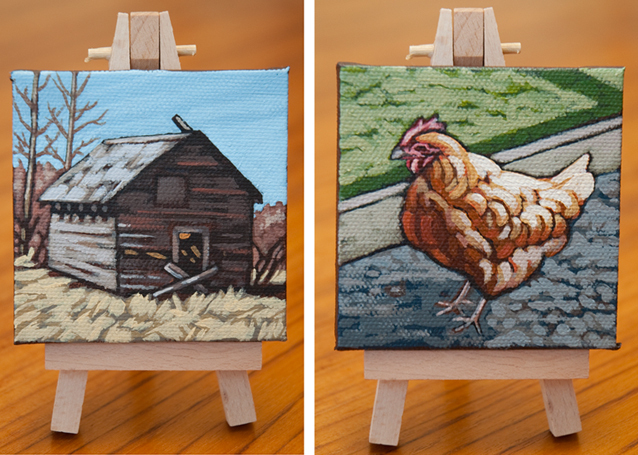 When I work on tiny paintings, I often do 2 or 3 at the same time. I have found that there is a large time investment for one, but to do an additional one or two does not add that much time to the process. 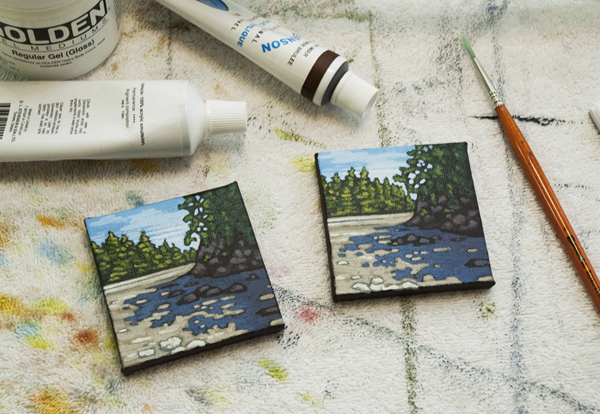 For instance, if 1 tiny painting takes 2 hours to complete, I can probably finish a set of 3 in 2.5 to 3 hours. Of course, each painting does not come out the same. They share the same general colours and composition, but I try not to be too picky about making all the details match. Each one is truly an original. Can you spot the differences? 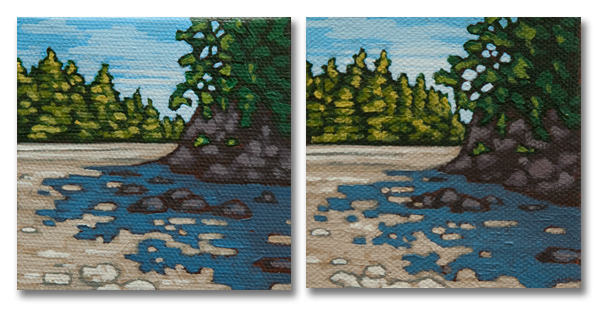 East Side of the Road & West Side of the Road, 4" x 6"
These are two paintings of the same road on Westham Island, near Delta, BC. One is a view of east side and the other is the west. 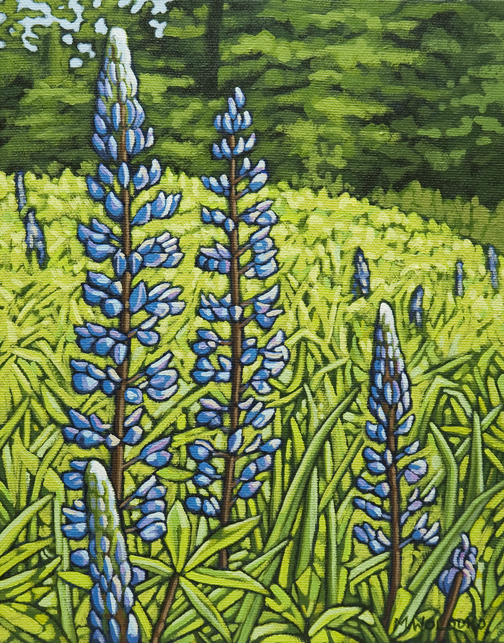 They are little (4″ x 6″) and I finished both in one day. My goal was that each one would work on it’s own, or they could be displayed together – as sort of a diptych. 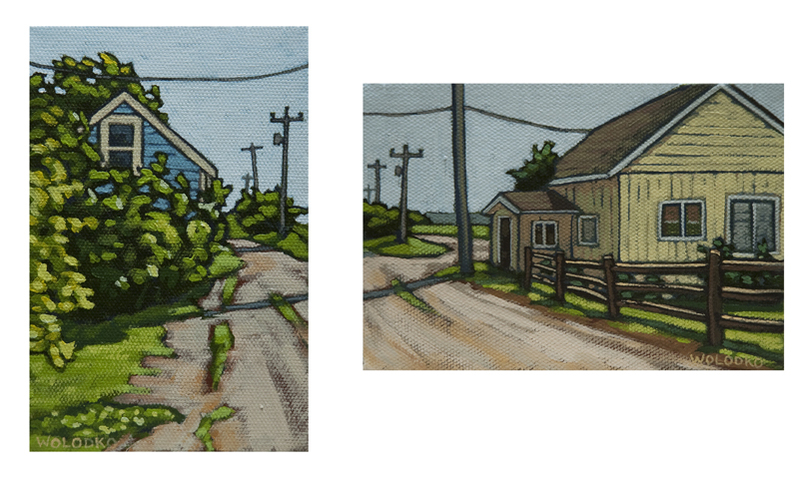 I love to paint old buildings, power poles and power lines, so I had a lot of fun with these paintings. Sometimes I have trouble knowing when a painting is finished. When the painting is nearing completion, I have this need to tinker – brightening here, darkening there, adding more detail, fine-tuning the colour, and on and on it goes. The trick is knowing when to stop, before the painting becomes overworked. So, I am taking a break from this one. I think it might be done, but I’m not sure. I have to look at it for a while. 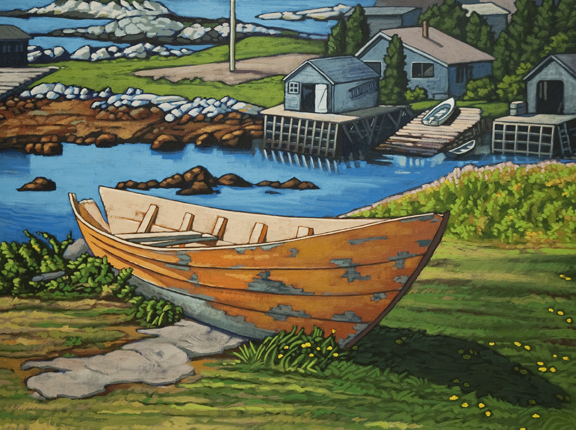 By the way, I’ve painted this boat before (several years ago). You can see the first version on my home page or here.